When HR Employee comes to mind, some may immediately think of those who make colorful PowerPoint presentations, as people who spend all day interviewing candidates, and others may see them as people to approach with complaints when things at the office get rough. However, HR managers are much more than the accumulation of those beliefs. Holding the title of HR manager in a tech company nowadays means carrying so much responsibility – sometimes it may feel like your head is about to explode. 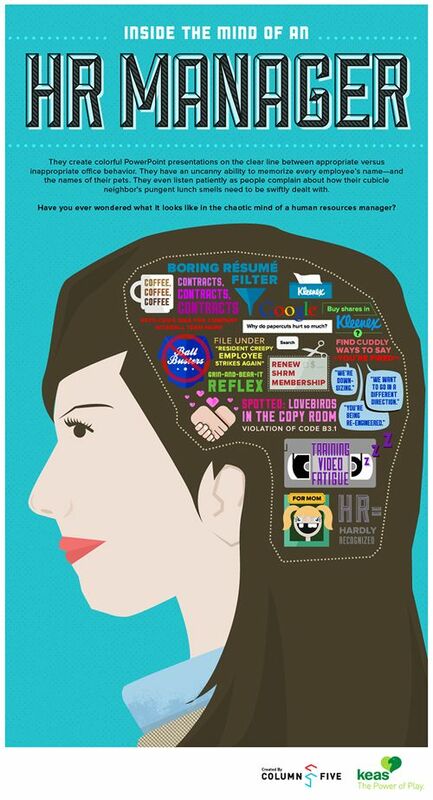 This infographic by Column Five and Keas takes us into the mind of an HR manager, revealing everything they need to deal with on a daily basis – from going over training videos (and thinking about moving to a more engaging method of learning…) to drafting contracts and dealing with code violations in the office. Revelations about some of the additional HR duties may conjure up a greater understanding of the important role the department serves for a growing organization.